New Orleans Real Estate FAQ | What Does “As Is With a Waiver of Redhibition” Mean? Tracking how people get to my website allows me to see, in detail, exactly what kind of information consumers are looking for about New Orleans real estate. Recently, I had a website visitor that came to me by way of a search for “louisiana property disclosure vs. as-is”. I figure that if one person asked that question, then there are other folks out there wondering the same thing. FIRST, it is important to point out that under Louisiana law, sellers (with few exceptions) are required to provide a property disclosure, whether they are selling the property “as is” or not. Disclosing or selling “as is” is not a one or the other decision. Unless you are one of the few who meet the state mandated exceptions, you MUST provide a disclosure to all purchasers. The law applies equally to those using a professional REALTOR® and those attempting to sell their property on their own. For a list of those exempt from providing a property disclosure, contact us at 504-327-5303. As a listing agent, I always recommend that my sellers transfer their Louisiana property to the new owners with an As-Is Clause and Waiver of Redhibition. (For people living in other parts of the country, Redhibition is basically the Louisiana civil version of a lemon law, allowing purchasers to sue for unseen defects.) 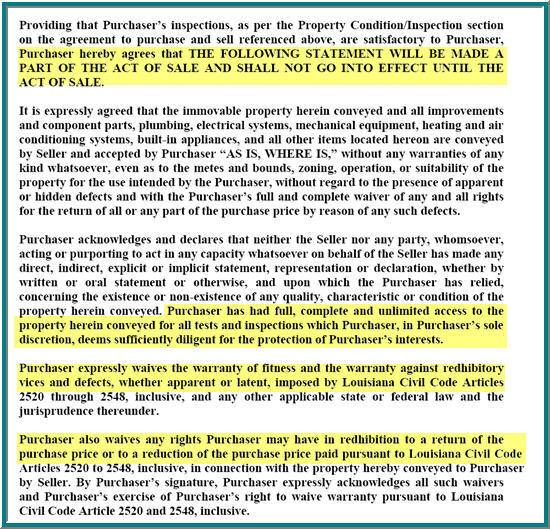 The waiver of redhibition is intended to minimize the number of lawsuits brought by purchasers against the sellers of real property in Louisiana. IMPORTANT NOTE: This does NOT mean that the purchasers cannot do inspections or that they cannot walk away from the purchase if there are inspection issues that cannot be resolved by negotiating repairs or a price adjustment. It does mean that after inspections have been completed to the purchaser’s satisfaction the following language will become a critical part of the act of sale documents (the highlights are mine). Do you still have questions about As Is and Waivers of Redhibition? Please call us at 504-327-5303. We’d be happy to refer you to a local real estate attorney who is well versed on this topic.